During a Nintendo Direct presentation, Nintendo dropped a moon-sized announcement: The Legend of Zelda: Majora’s Mask 3D, a remake of the beloved Nintendo 64 game, is coming exclusively to Nintendo 3DS in spring 2015. The Nintendo Direct video also revealed new details about amiibo functionality and upcoming games like Splatoon, Xenoblade Chronicles X, Kirby and the Rainbow Curse, Code Name S.T.E.A.M. and Captain Toad: Treasure Tracker. Mario Kart 8 DLC: The first pack of DLC for Mario Kart 8 launches on November 13 and includes new courses, vehicles and characters from other Nintendo games like The Legend of Zelda, F-Zero and Excitebike. Players can buy and download from the in-game menu or in the Nintendo eShop on Wii U.
amiibo: In addition to Super Smash Bros. for Wii U, multiple games will be compatible with amiibo, including Mario Kart 8 and Hyrule Warriors in 2014, plus Captain Toad: Treasure Tracker, Kirby and the Rainbow Curse, Yoshi’s Woolly World and Mario Party 10 in 2015. This amiibo functionality will be available to players in the following games when the first wave of figures launches on November 21.
o Mario Kart 8: When players tap Mario, Luigi, Peach, Yoshi, Donkey Kong, Link, Captain Falcon, Fox, Samus or Kirby amiibo figures on the Wii U GamePad controller, they will receive a Mii racing suit themed to that particular amiibo character. Players’ Mii characters can wear these detailed suits when racing in the game. o Hyrule Warriors: A Link amiibo figure gives players a special “Spinner” weapon in the action-packed Wii U game. Additionally, every Super Smash Bros. series amiibo figure will grant randomly selected materials, weapons or rupees in the game. The first wave of amiibo starring characters like Mario, Link and Samus launches on November 21, the same day as the Super Smash Bros. for Wii U game, and the second wave of six characters hits store shelves in December. Splatoon: The four-on-four online multiplayer shooter also features a single-player mode, which pits a player’s squid-like Inkling character against an army of octopi equipped with an arsenal of ink weaponry. Splatoon will launch exclusively for Wii U in the second quarter of 2015. Xenoblade Chronicles X: In this new RPG from Monolith Soft, players embark on an epic quest in a new world. Using the city of New Los Angeles as a home base, players will embark on missions, collect items and take on requests from residents. Xenoblade Chronicles X – which features a bigger world than Xenoblade Chronicles for Wii – is scheduled to launch exclusively for Wii U in 2015. Kirby and the Rainbow Curse: The newest game in the charming Kirby series finds the lovable pink puffball journeying through a world made of clay. Players guide Kirby along a rainbow line drawn on the Wii U GamePad controller’s touch screen. A new four-player multiplayer mode lets one player play as Kirby and focus on drawing rainbow lines on the GamePad, while the others control a trio of Waddle Dee characters that can collect items or carry Kirby around. Kirby and the Rainbow Curse launches for Wii U in February 2015. Captain Toad: Treasure Tracker: A new trailer for the game debuted during the Nintendo Direct and showed snippets of some of the 70+ levels players will encounter. The game also features different challenges that, once completed, will reveal additional content in the game. Captain Toad: Treasure Tracker launches for Wii U on December 5. The Legend of Zelda: Majora’s Mask 3D: One of the most talked-about games in the history of The Legend of Zelda series is coming to Nintendo 3DS. 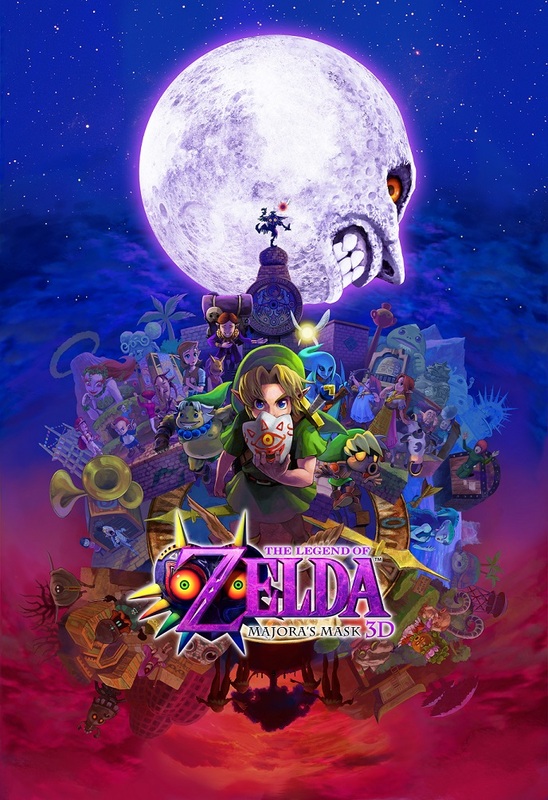 Launching in spring 2015, The Legend of Zelda: Majora’s Mask 3D brings Link’s suspenseful, intricate quest through the mysterious world of Termina to a hand-held system for the first time with enhanced 3D graphics and added features for a smoother game experience. Code Name: S.T.E.A.M. : From Intelligent Systems, the creators of the Fire Emblem and Advance Wars series, comes Code Name: S.T.E.A.M., a turn-based tactical action RPG that features characters like … Abraham Lincoln? That’s right: Abraham Lincoln leads a team of newly revealed playable characters like Tiger Lily and Tom Sawyer. Each character in the game possesses special abilities, like Tiger Lily’s healing and Tom Sawyer’s gadgets, that help players complete missions across well-designed battlefields. Code Name: S.T.E.A.M. will launch exclusively for Nintendo 3DS in spring 2015. Ultimate NES Remix: The NES Remix series comes to Nintendo 3DS, combining 16 of the top NES games from the NES Remix and NES Remix 2 games on Wii U. Famicom Remix Mode offers challenges from the Japanese version of NES Remix, featuring slightly different sound effects and backgrounds, and in Speed Mario Bros., players can play through the original Super Mario Bros. ramped up to super speed. Ultimate NES Remix also features online leaderboards, allowing players to compare scores in challenges with others in their region. The nostalgic game launches for Nintendo 3DS on December 5. PIKMIN Short Movies: Last month, Shigeru Miyamoto premiered PIKMIN Short Movies, a series of animated short films he directed that takes place in the Pikmin universe. These short films are now available as one paid download in the Nintendo eShop on Wii U and Nintendo 3DS. As a supplement to the movies (in addition to popcorn, of course), a free demo version for Pikmin 3 is also now in the Nintendo eShop on Wii U.
Sonic Boom: A free demo for Sonic Boom: Shattered Crystal, the new Sonic the Hedgehog game launching exclusively for Nintendo 3DS on November 11, is now available in the Nintendo eShop. The free demo for exclusive Wii U game Sonic Boom: Rise of Lyric (also launching on November 11) will be available on December 4. In addition, a new Nintendo 3DS Home Menu theme and Puzzle Swap panel inspired by Sonic Boom are both coming to Nintendo 3DS on November 11. This entry was posted on Thursday, November 6th, 2014 at 11:57 am and is filed under Action Adventure, Driving, Fighting, Mobile, National News, Platform, Puzzle, Upcoming Releases. You can follow any responses to this entry through the RSS 2.0 feed. You can leave a response, or trackback from your own site.